Track 2-11 on my copy (which I have owned since the original week of release) has a pressing error, where a minute or (if even that far in) the track / cd freezes / pauses. Anybody else copy have the same issue or just mine?. Have always been curious. Quite interesting... Having taken all the opinions under considerations, I still decided to include it in my collection. No regrets. It looks great, sounds great, no problems. As far as I am concerned this issue is well worth the money. yes. terrible pressing and mastering, please do not buy. waste of money . Bought this brand new from HMV sept 2018 don’t know if same pressing but barcode and etchings in the runout grooves match above. Mine sounds brilliant! A nice compilation, combining both Dire straits and Knopfler solo work. Roughly every 10 years we receive a new "best of" from Dire straits. In 1988 we had "Money for nothing", in 1998 "Sultans of Swing" and this is the third best of entitled yet again as one of their most famous songs "Private investigations". Even though I still believe that "Money for nothing" is by far the best of them all, even though it doesn't cover the three last records of the band, this particular compilation has a great difference. 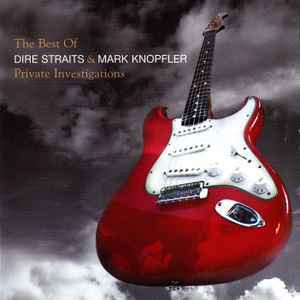 It contains songs from both Dire Straits and Mark Knopfler solo records. For a serious fan, this compilation also offered a new song, but since it has been issued at the Harris/Knopfler collaboration "All the roadrunning", it has nothing new or unique to offer. The record company thought it was a good idea to market three different versions of the record, one as a single disc, another one as a double disc, and a third one as a deluxe packaging with book containing the 2CD version. The one CD version is way too limited for both Dire straits and Mark Knopfler solo work. The two CD version unfortunately devotes one CD for Dire straits and the second one to Knopfler's solo work. This is totally unfair to Dire straits work that is not fully represented. The deluxe edition is nothing special, with a book containing photos and a small text, that don't quite please the target group, the serious fan. I confirm, terrible pressing and mastering, please do not buy. Mercury are you pressing records with your shoes ??? ?